So I have spent the last week looking for the bags that I want to carry for the upcoming Spring/Summer seasons. I internet searched high end resale boutiques and came across Ditto Boutique in Dallas. For all my Dallas readers this is definitley a place you want to visit. This shop is so chic and carries a range of merchandise from Banana Republic to Prada. She carries everything from shoes to purses to even fur (dont come after me PETA members). In Ditto, you can come across brand new merchandise that has never been used still with original tags or gently used high end merchandise. All her merchandise is clothing is merticulously cared for straight from the dry cleaners, so no worries on taking her items to the cleaners. This is one of the benefits of shopping high end resale. Also, with a place like this you know each piece is hand selected by the owner. This particular owner is Jane Denike, a former stylist, and you can tell she really loves her store and the pieces that she selects to sell.. She is also super nice and happy to help. She also is thinking about putting up a internet boutique so look out for that. This bag did not have its tags, but prices generally range from $200-$300 and I paid I think $69.00. So for handbags that originally totaled for about $450, I paid a little under $120 for. I also bought a third bag from Dillards that was recommended to me by a friend which retailed for $88.00. For those of you wondering about my attire in the picture, the dress is from Jibri - I bought it last summer from the Jibri Etsy Shop I think it was $160, I have attached the link for a similar dress different fabric. I still love this dress. The scarf and belt are both from Target. The shoes are from Nordstrom Rack for $25, I bought them just a couple of weeks ago. And the jacket is from Lane Bryant, it is the boyfreind blazer I blogged on a couple of months ago. Oh, I love! It reminds me of the Valentino Petale satchel, which retails for something ridiculous like $2,400 if I remember correctly. You look so cute. THe bags are hot. 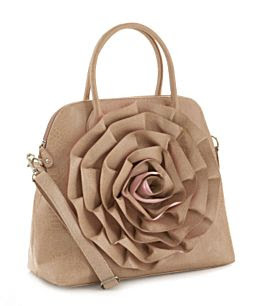 Maxx New York and Hype have some really good handbags that truly rival designer bags. I must say, I really enjoy reading your blog. Keep up the good work. Cute look! I have on that scarf today! 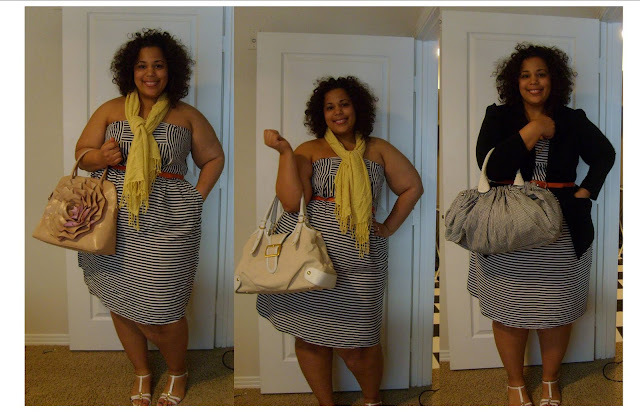 I love all three of the bags especially the one from Dillard's. And you look easy breezy beautiful, you know like the cover girl song :). My God, I love that Dillard's purse, it looks like a Prada I saw a few years back. Pure love! I love Ditto, I havent been in awhile. But I found one of my favorite Miltary Jacket in there. They have great pieces..